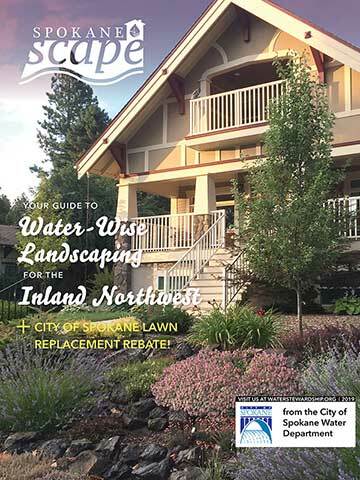 A SpokaneScape is a water-efficient landscape that has been designed specifically for Spokane residents; its focus is on the replacement of lawn with low-volume irrigation and drought tolerant plant material. 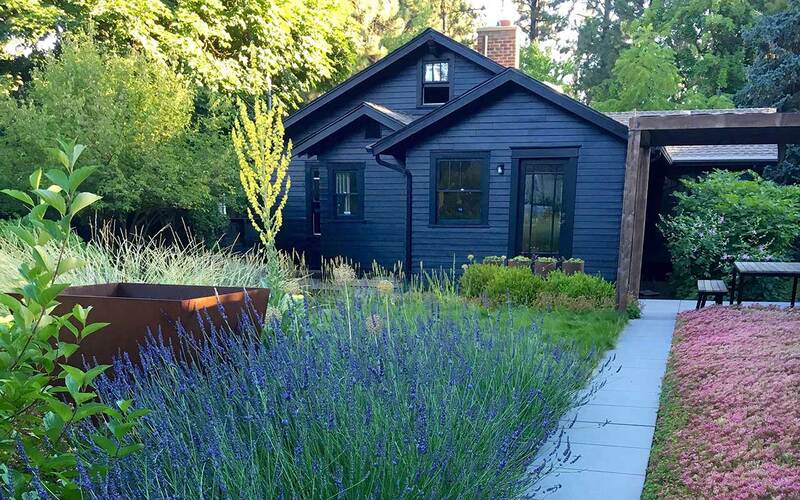 A well-designed SpokaneScape will beautify your property, protect or natural resources and the environment; and will inevitably reduce yard maintenance. You can earn up to a $500 credit towards your water bill after removing your lawn and replacing it with water-smart plants and mulch. You may claim $0.50 per square foot of lawn removed with a minimum of 300 square feet. 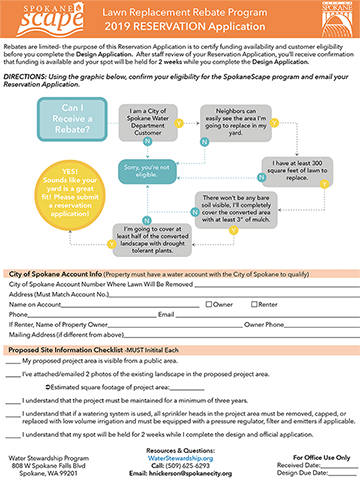 SpokaneScape rebates are limited, we are offering this RESERVATION APPLICATION as way to ensure that there is funding available before you proceed with completing our DESIGN application. After your Reservation application is received staff will review it and confirm that funding is available, if funding is available you will then receive an Authorization to Design and your spot will be held for 2 weeks while you work on your DESIGN APPLICATION. 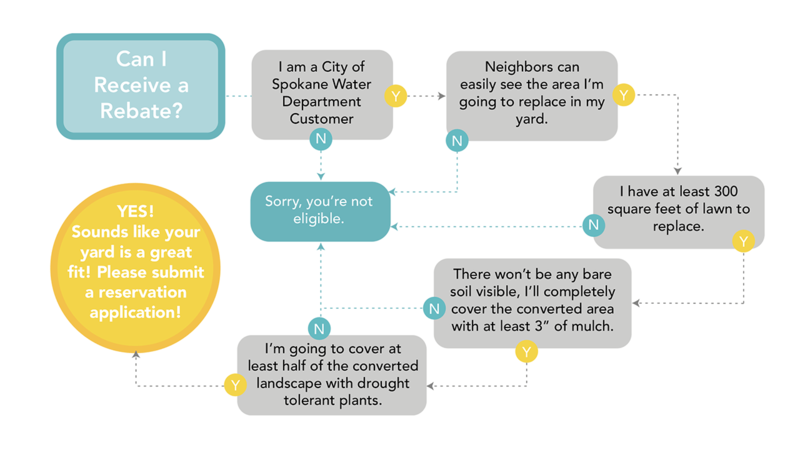 Create your drought tolerant SpokaneScape Plan! 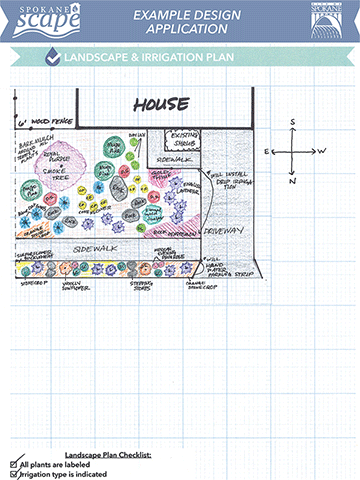 Complete and submit your DESIGN APPLICATION. Once submitted, your DESIGN APPLICATION will be reviewed and you will be contacted by our staff to schedule a required pre-inspection. PRE-INSPECTIONS are required before beginning any conversion work. The 45 minute pre-inspection will give staff a chance to answer any questions you have about the program, your plan, or installation. At the pre-inspection, staff will also verify measurements and take additional photos if necessary. Following your successful pre-inspection, you will be authorized to proceed with your SpokaneScape installation! Once you have been authorized to proceed with your SpokaneScape installation you will have 90 days to complete your installation. Once your SpokaneScape is 100% complete, submit your FINAL INSPECTION REQUEST, once received and reviewed, a staff member will contact you to schedule your FINAL INSPECTION where your rebate will approved! The hard part is over and you now have a stunning drought tolerant landscape that is sure to make you the envy of your neighborhood! 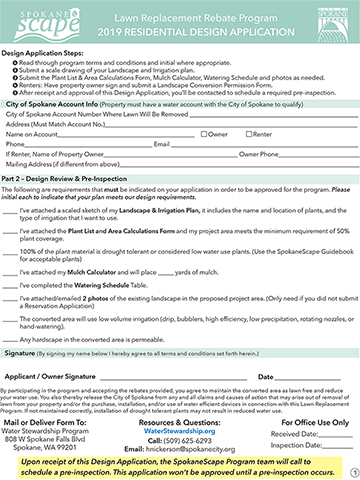 Following your successful FINAL INSPECTION a Rebate will be issued to your City of Spokane Utility Bill! Let's face it, we're all not all DIY'ers, because of this, we've reached out to local businesses who are passionate about providing their customers with water-efficient landscaping products and services. 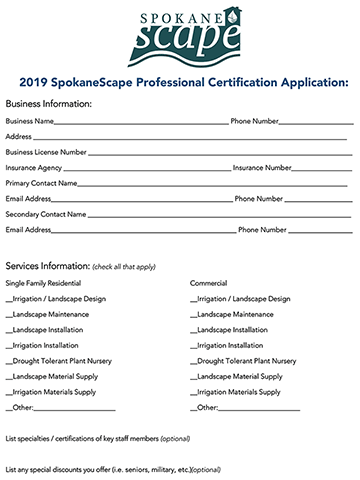 The following professionals are SpokaneScape Certified, have a clear understanding of the program, and are ready to assist you with your new water-wise landscape! We are pleased to announce a new and exciting opportunity for you to join a growing network of local landscaping professionals who are passionate about providing their customers with water-efficient landscaping products and services. We are encouraging local Landscape Architects, designers, contractors, plant nurseries and material suppliers to join our SpokaneScape Professional Certification Program at no cost. The City of Spokane's Water Stewardship Program will feature a list of our SpokaneScape Certified Professionals on our website and will only make recommendations to its SpokaneScape customers based on this list. This year we've expanded our program to include commercial properties, these commercial SpokaneScape applicants are required to choose designers and contractors from this list of SpokaneScape Certified Professionals. 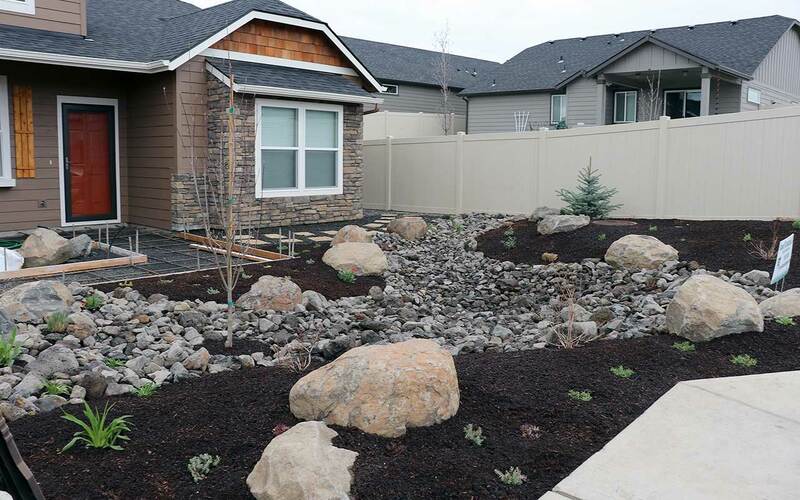 Companies participating in the SpokaneScape Professional Certification program will encourage our customers to choose water-smart landscaping and irrigation to help protect the future of our water resources. These companies also ensure their staff members are trained in water-efficient landscape and irrigation practices, in part by reading our SpokaneScape Guidebook and taking our simple 10 question quiz. Please see our SpokaneScape Guidebook and our Residential Design Application to assist you with this quiz. We value your experience and expertise and thank you for your consideration in joining us to strengthen our program!